Nathan Caine | First Financial Security, Inc.
First Financial Security’s field representatives have given Nathan Caine a nickname. They call him “Money Man.” But Nathan doesn’t mind, because it sums up what he does everyday for them as Director of Commissions. He’s the one who makes sure they get paid accurately and on time, every time. Born in Alpharetta and raised in nearby Woodstock, GA, Nathan was a natural born money man, who says he always loved saving money and working with numbers. 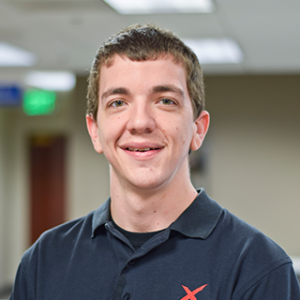 In October of 2010, just five months after he graduated from Valdosta State University with a bachelor’s degree in Finance, Nathan found himself interviewing with FFS. His hard work got him noticed, and he was offered the position, heading up the Commissions area. He feels right at home here and in his comfort zone, as he works with the company to develop systems to handle the inevitable increases in the Commissions areas as the field force and the business it produces continue to grow. Nathan says one of the things he likes best about working at First Financial Security is the family-like environment created by CEO Phil Gerlicher. Everyone, whether they’re in the field or the home office, is treated as if he or she is a member of the family. It generates a lot of good will, and it also creates opportunities, like the one Nathan received. For Nathan, though, it always comes back to the agents. Nathan and wife, Bianca, are enjoying raising their two dogs: Isabelle, a chihuahua, and Chance, a beagle.